The intense race between Amazon and Flipkart to reach to the podium of India’s e-commerce market is worth all your time. However, most of you may need good amount of patience to see this race go through the finish line. 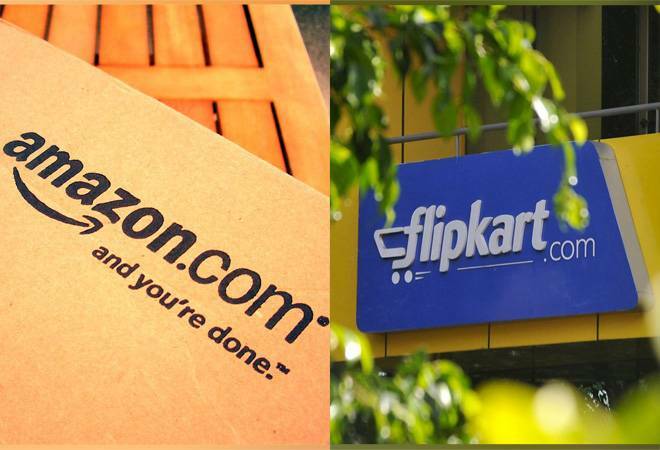 That’s because the race between Amazon and Flipkart is proving to be a cat and mouse race were predicting a clear winner is proving to be a major challenge even for the seasoned industry experts. Now a report prepared by British based multinational bank Barclays has added yet another twist to this cat and mouse race. The Barclays report suggests that the wind is most likely flowing towards Amazon. However, the report doesn’t discount the fact that Flipkart is breathing down the neck of the U.S. based online retail giant. In fact, the report in a pretty clear yet subtle way seems to indicate that there is still no clarity as to who might emerge as an eventual winner in Amazon & Flipkart race. Now a new report indicates that the race between Amazon and Flipkart is indeed an intense affair. Amazon clocked $7.5 billion in gross merchandise value (GMV) in the financial year ending on March 31, 2018. This is tad higher than Flipkart’s $6.2 billion on standalone basis clocked during the same period. While Amazon is certainly ahead in terms of GMV, its lead proves to be a very marginal one if Flipkart takes into account the GMV clocked by its two fashion units Myntra and Jabong (both these units are set to merge with Flipkart.) In fact, all thanks to Myntra and Jabong, Flipkart finds itself neck to neck with Amazon India. Flipkart also continues to be ahead of Amazon in terms of revenue. India’s homegrown retail giant currently clocks revenue of nearly $3.8 billion as compared to $3.2 Bn clocked by Amazon. However, Amazon’s revenue is growing at a faster pace and is fast catching up with Flipkart. The observation made by this report clearly denotes that the race between these two online retail giants is expected to become tighter as both approach the finish line. Analysts claim that a player that is able to scale the business fast without relying on deep discounts will reach the finish line first. Meanwhile, Flipkart will have to brace for more challenges in this tough competitive environment as it looks to smoothen up the ongoing transition phase. The transition phase has been expectedly induced by Walmart’s takeover. Flipkart’s transition phase, by the way, has become little tricky following Binny Bansal’s unexpected resignation. As for Amazon, the online retail giant has a deep pocket to fight out an enduring battle, but it can ill afford to rely only on its financial supremacy.